On the 200th birth anniversary of Karl Marx, Bernard D’Mello imagines a critical analysis of capital and capitalism as a global system. The short piece draws on ideas from the works of Paul M. Sweezy; Paul A. Baran and Paul M. Sweezy; Mao Zedong; V. I. Lenin; Samir Amin; Bertell Ollman; Immanuel Wallerstein; John Smith; István Mészáros; John Bellamy Foster; Robert W McChesney; R. Jamil Jonna; and Paul Burkett. An earlier version appeared as a “Comment” in the Mumbai-based Economic & Political Weekly in its issue of May 5, 2018. “Ruthless criticism” was one of Karl Marx’s principal maxims. He practiced it with devastating effect in his critical analysis of capital and capitalism. For this, 200 years since his birth, he remains unsurpassed as one of the world’s most influential intellectual figures. Indeed, he applied the ruthless-criticism maxim to his own views too, constantly discerning what was genuine and what was false in what he had written. For example, having relied upon British colonialist source material, at first in 1853, he thought of British colonialism as the “unconscious tool of history” in initiating—what he hoped would be—the economic transformation of India. Later, with the relevant empirical evidence at hand, in a letter to Nikolai Danielson in St. Petersburg from London on February 19, 1881, he viewed “what the British take from” Indians “without any equivalent” as a “bleeding process, with a vengeance.” Marx always remained wide open to empirical evidence. Moreover, his concepts and definitions were open-ended and adaptable to new and changing historical situations. Starting off as a romantic idealist, Marx critiqued G W F Hegel’s philosophical idealism, but discerned “great merit” in the dialectical kernel of his thought. He also acknowledged his intellectual debt to the materialist philosopher Ludwig Feuerbach, but critiqued his thought as passive, for it failed to grasp the significance of “practical-critical” and “revolutionary” activity. Of course, Marx was particularly struck by the prevailing harsh material conditions of life of the working class, and this too shaped the development of his own version of materialist dialectics and historical materialism. From then on there was no sharp break in his mode of thought. Indeed, one discerns an organic bond between the “early Marx” and the “late Marx.” The key influences were German philosophy, French socialism, British political economy, and, much later, Russian populism. In Capital, Marx employed the abstract-deductive method, and what later came to be known as the procedure of “successive approximations,” wherein the analysis moves, step by step, from the more abstract to the more concrete as simplifying assumptions are dropped at successive analytical stages. In each successive analytical stage, the theory thereby takes account of—and is able to explain—a wider range of actual phenomena. The method of abstraction helps isolate key aspects of the real world for an intensive investigation, for example, the nature of the capital-labor relation, in Capital, Volume I. On a lower level of abstraction, more aspects of the reality are taken into account, which may modify the tendencies discerned at a higher level of abstraction. Importantly, Marx’s method was and is in its essence, historical. The process of change, inherent in a specified set of social relations, is the product of human action; society is both changing and, within limits, “under circumstances directly found, given, and transmitted from the past,” can be changed. There is no capitalism that is not historical capitalism. And so, at the core of his analysis of capitalism in Western Europe, is how it came into being, how it has been working, and where it is likely to lead. There is always an uneasy tension between historic forces promoting change and systemic forces bent on maintaining equilibrium. The struggle leads to a pulling apart of what is functionally united, and thereby brings about significant change. So even as Marx’s critique of capital and capitalism of the 1860s remains the most radical, inevitably, the economy and society have changed very significantly since then. What is necessary is a continuation of the research work that Marx began alongside a constant refining of his method. His theory was open-ended, and he would surely have expected us to critique it, especially from a Marxist point of view, in order to enrich it. With the passage of 150 years since Capital, Volume I was first published, there is a significant additional empirical reality that calls for substantial modifications in the theoretical abstractions Marx undertook. Capitalism now functions on a truly global scale. The global capitalist system’s periphery and semi-periphery is economically, politically, and militarily subordinate to its centre. A much higher rate of exploitation in the periphery and semi-periphery, and an unequal sharing of the system’s surplus, with the ruling classes and professional elites of the centre getting the hindmost, forms the core of the system’s exploitative institutional structure. With stagnation (slow economic growth, high unemployment/underemployment and excess capacity) at the centre, a worldwide proliferation of oligopolistic multinational corporations, and “financialization of the capital accumulation process,” a large, relatively independent financial superstructure towers over the “real” part of the world economy and most of its national units. This financial superstructure has, in turn, influenced the structure and functioning of the world’s major “real” economies and the corporations therein, obliging their managements to also engage in financial speculation. With retained earnings not finding profitable outlets in real capital formation, they are diverted into speculative financial channels. Surely a contemporary version of Capital, a critical analysis of capital and capitalism on a global scale, whether of Volume I, II, or III, will be quite different from the original. Given the space constraint, one can only list what this will entail: Class analysis at the world level; the value of labor power and its vastly different prices at the centre, the periphery, and the semi-periphery; value theory as a theory of super-exploitation and unequal exchange; value theory as a theory of surplus-value distribution in oligopolistic market structures; poor peasants and other petty-commodity producers exploited by capital; unpaid domestic work that reproduces the commodity labor-power; the global reserve army of labor; proletarianization as the degradation of the majority to a condition of utter powerlessness; natural resource grabbing and monopolistic rents; the unsustainable appropriation of use values from “nature” and the unsustainable dumping of the resulting “waste” of production and consumption on to “nature”; ecological imperialism; instability, crises, and the problem of effective demand; financialization, the financial superstructure, and its relation with and impact on the “real” economy; monopoly-finance capital; an accumulation theory that takes account of both, adding to the stock of existing capital goods and to the stock of financial assets, and the interaction of these two aspects; the state as capital’s political command structure; the sales effort; civilian government; militarism and imperialism; the main contradictions and the principal contradiction; and socialist social revolution. 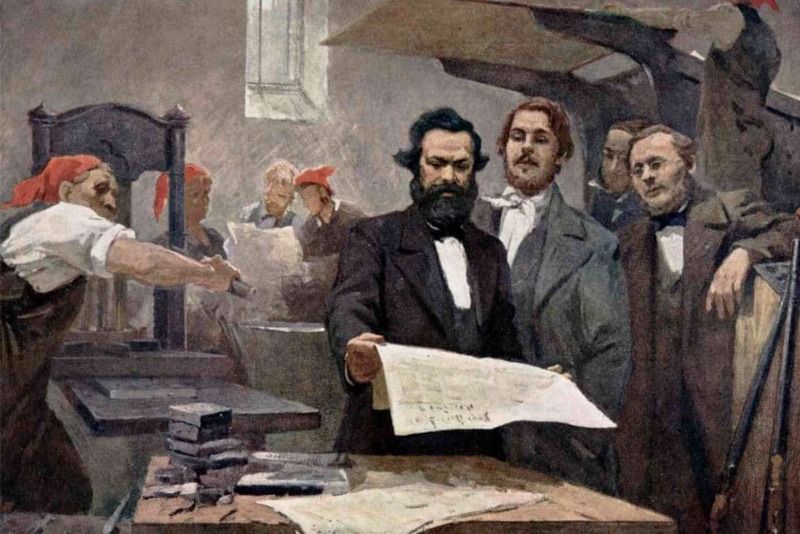 Two hundred years after Marx’s birth, the challenge is to reinterpret the world using his mode of thought and his method—historical materialism and materialist dialectics—and in the process, critique the old interpretations which we have inherited. In particular, it is high time one discarded the mechanistic view of Marxism as an economic determinism that supposedly yields a theory of history called historical materialism, which is claimed to be valid for the entire lifespan of the human species! The challenge of reinterpreting the world and changing it through a socialist social revolution has become urgent, for humanity may not have another 200 years if capital and capitalism has its way.